Why is the Holiest Shrine in Christianity Guarded by Two Muslim Families? The Church of the Holy Sepulchre in Jerusalem is considered to be the holiest site in Christianity. According to tradition, this was the place where Jesus Christ was crucified, buried, and resurrected from the dead. Whilst this sacred site is divided between several Christian denominations, the overall custodianship of the Church of the Holy Sepulchre is in the hands of two Muslim families. The original Church of the Holy Sepulchre was constructed in the 4th century AD, during the reign of the Emperor Constantine. This structure was eventually destroyed during the 11th century AD by the Fatimids, though the church was rebuilt not long after its destruction by the Byzantines. Modifications were made to the Church of the Holy Sepulchre by the Crusaders after they had captured Jerusalem in 1099. From the time of the Crusades up until the 19th century, the Church of the Holy Sepulchre had three custodians – the Greek Orthodox, the Armenian Apostolic, and the Roman Catholic Churches. During the 19th century, this custodianship was extended to three more churches, namely the Coptic Orthodox, the Ethiopian Orthodox, and the Syrian Orthodox Churches. Nevertheless, these three churches have lesser responsibilities as compared to the three original custodians. Whilst these custodians generally co-exist peacefully with each other, it may be pointed out that conflicts, sometimes leading to violent confrontations, have broken out occasionally in modern times between them. It is perhaps not too difficult to imagine that the medieval custodians of the holiest site in Christianity would have found themselves in disagreement with each other at times, and perhaps even being involved in physical violence, as some of their modern counter-parts have had the same experience. This has been cited as the foremost reason for the overall custodianship of the Church of the Holy Sepulchre being in the hands of two Muslim families. 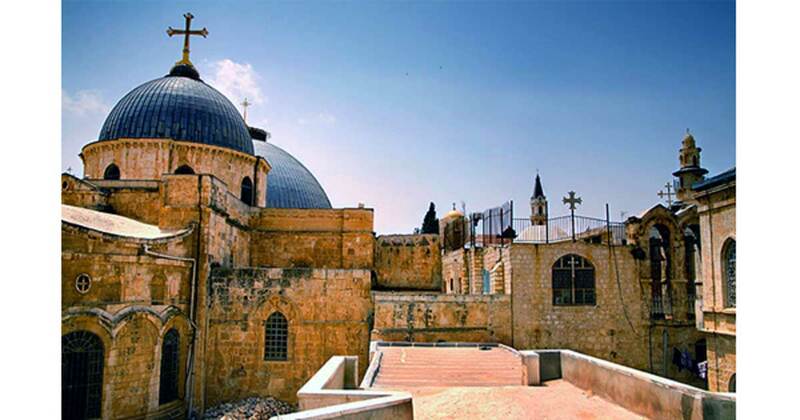 According to one account, the Muslim custodianship of the Church of the Holy Sepulchre was granted by the Caliph Omar when Jerusalem was captured by the Muslims in 637. The Nuseibehs, a family whose origins lie in the city of Medina, and claiming to have relations with the Prophet Muhammad, were chosen for this task. 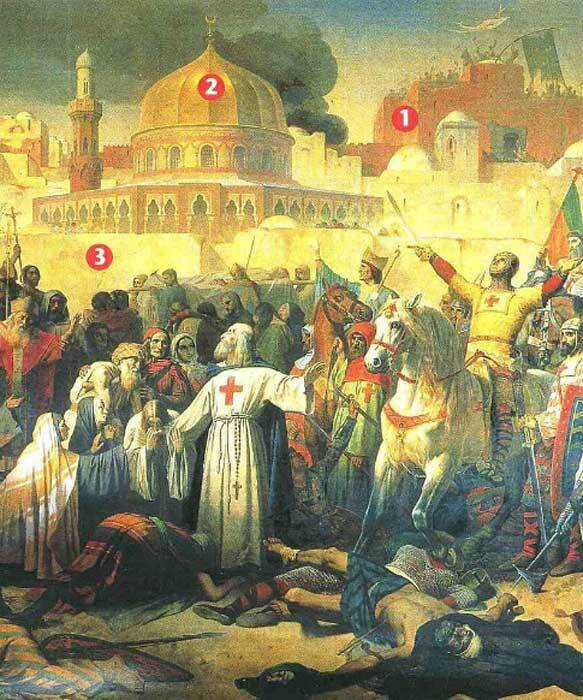 After several centuries of Muslim rule, Jerusalem fell to the Crusaders. In 1187, however, the Church of the Holy Sepulchre and Jerusalem were once more in Muslim hands, as they were captured by Saladin. The Nuseibehs were re-appointed by the Sultan to serve as the caretakers of the church. Saladin had the second front gate of the church sealed, and gave its key to this family. According to the Nuseibehs, it was only during the 16th century (when Jerusalem was under Ottoman rule) that the Joudeh family was appointed as the ‘co-guardians’ of the church. The Joudehs, however, claim that they had been the guardians of the church since the time of Saladin. Furthermore, the first Joudeh who was given the key to the church is said to have been a sheikh, and was not expected to do physical labor. Therefore, the Nuseibehs were appointed to unlock the gate of the church. Today, the Joudeh family continue their job of protecting and keeping the key, whilst the Nuseibeh family is responsible for opening the gate to the church. As a matter of fact, there are actually two keys today. One of these is claimed to be 850 years old, though it is now broken, and hence no longer used. The other key, which is 500 years old, is the only functioning key, and is kept in a small office attached to the church. Since the end of the 19th century, a ceremony is held each year by the three main Christian denominations to renew their acknowledgement of the Muslim custodianship of the Church of the Holy Sepulchre. The custodians from each of the three main denominations are given the key for as long as they need to make a procession around the church, and then allowed to open the door after the morning liturgies, after which it is returned to the Muslim guardians. This occurs on Maundy Thursday, Orthodox Good Friday, and Holy Saturday for the Roman Catholic, the Greek Orthodox, and Armenian Apostolic Churches respectively. Can you guys get a better webmaster? these scripts are really annoying and dragging down the site. I know you have to advertise, but this is ridiculous.